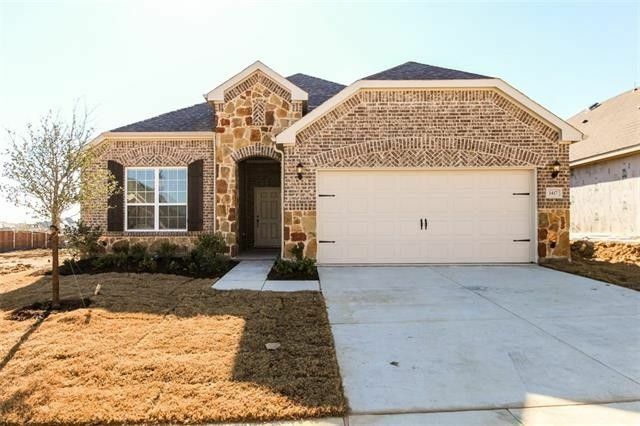 NEW CONSTRUCTION - Canyon Falls 50's in Northlake. 2 story Carissa plan with stone & brick accent exterior - Elevation C. Available for IMMEDIATE move-in. 4BR, 3BA + Study + Formal Dining Room + Game Room + Covered Patio - 2824 sq.ft. Open plan with stainless appliances, granite counters, staggered cabinets & pendant lights in Kitchen. Hardwood floors throughout main living areas, stone fireplace & crown molding in select areas. Directions: 114W to US377.Go North.Left on FM1171 Cross Timbers.Right on Canyon Falls.Left on Westbridge.Right on Meridian.Left on Parkdale.Right on to Northdale.